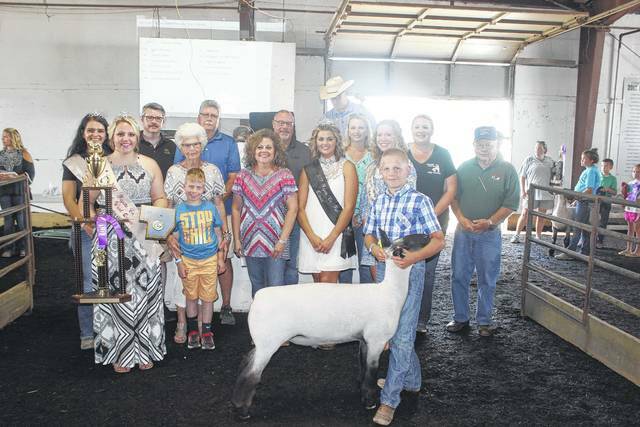 Thaddeus Stuckey’s grand champion market lamb sold for $1,500 at the Fayette County Fair Market Sheep Show on Friday evening. Stuckey is pictured with buyers and fair royalty: (front row) Sheep Queen Macy Detty, (second row) Fair Attendant Susanna Eckstein, Loretta Stuckey and Wylee of Stuckey Farms, Diane Faris Munro of Faris Insurance, Fair Queen Marissa Sheets, Fair Attendant Clare Sollars, (back row) Keith Tooill of McDonald’s, Mark Richards of First State Bank, Buck Minyo of LCNB, Tabby Melvin of Universal Dermatology, Michelle Bennett of Roller Haven, and Jim Chrisman of the Fayette County Republicans. https://www.recordherald.com/wp-content/uploads/sites/27/2017/07/web1_IMG_9417.jpgThaddeus Stuckey’s grand champion market lamb sold for $1,500 at the Fayette County Fair Market Sheep Show on Friday evening. Stuckey is pictured with buyers and fair royalty: (front row) Sheep Queen Macy Detty, (second row) Fair Attendant Susanna Eckstein, Loretta Stuckey and Wylee of Stuckey Farms, Diane Faris Munro of Faris Insurance, Fair Queen Marissa Sheets, Fair Attendant Clare Sollars, (back row) Keith Tooill of McDonald’s, Mark Richards of First State Bank, Buck Minyo of LCNB, Tabby Melvin of Universal Dermatology, Michelle Bennett of Roller Haven, and Jim Chrisman of the Fayette County Republicans.